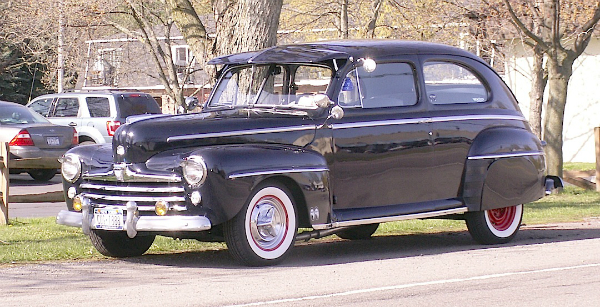 This old 1947-48 Ford Super Deluxe two-door looks like an extra from the movie American Graffiti. It’s certainly been all dolled-up with a visor, fog lights, spotlights, rearview mirrors, ’56 Oldsmobile-style “spinner” wheel covers, and full fender skirts (would the Olds spinners not clear the fender skirt in the rear?). The front fender “Moon Eyes” decal is an especially nice touch. Found this car a few summers ago in Lewiston. Jim Corbran, RRofWNY …and check out our Facebook page: Non-American Classic Cars The post RealRides Of WNY appeared first on Buffalo Cars.